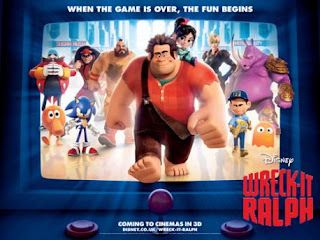 It feels almost perverse that American audiences had the pleasure of watching the latest Disney(-Pixar) effort 'Wreck-It Ralph' a good four months before the animated feature arrived in UK cinemas earlier this month. It's well worth the wait, an enjoyable, life-affirming adventure that pays homage to the history of video gaming. 'Paperman', the stunning short that precedes the film helps too. 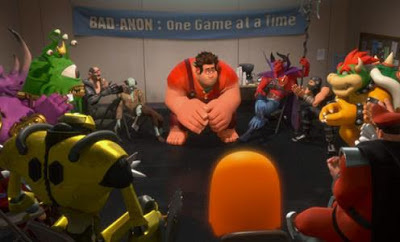 Wreck-It Ralph (John C Reilly) has been a "bad guy" for the last thirty years, pitted against "good guy" Fix-It Felix Jr (Jack McBrayer), in their arcade game Wreck-It Ralph. Thirty years of doing his job without a semblance of a pat on the back is the limit for Ralph, who abandons his game in search of a medal to finally feel worthwhile. His pursuit for heroism takes him first to Hero's Duty then Sugar Rush, where he meets a fellow outsider - Venelope Van schmeez (Sarah Silverman). Unfortunately for Ralph, he brings something into Sugar Rush that threatens the entire existence of the game. Soon, it's up to Felix and Hero's Duty team leader Calhoun (Jane Lynch) to help Ralph, Venelope and the other characters. But not before Ralph and Venelope help one another in their own ways, proving to each other that there's nothing wrong with being themselves. The central message of 'Wreck-It Ralph' does feel somewhat cribbed from dozens of other family films. Indeed, its finale seems quite reminiscent of the brilliant 1999 animation 'The Iron Giant'. Yet it does have one particularly unique selling point - bringing video game characters like Zangief from 'Street Fighter' and Sonic of The Hedghog fame to the big screen. In impressive 3D to boot - which works especially well during the flying and racing sequences. The slight issue is that the iconic characters feel rather tacked on, but for an inspired initial "bad guy support group" sequence. The appearance of a DJ that looks awfully like Skrillex equally feels a bit too try-hard than perhaps is intended. 'Wreck-It Ralph' would probably have been better served to have avoided these distractions. Arguably, it's the preceding short 'Paperman' that impresses most, stealing the thunder of its follow-up in much the same way 'Partly Cloudy' did to 'Up'. The beautiful black and white style and period setting of 'Paperman' are all the more striking when related to the larger-than-life 'Wreck-It Ralph'. Together though, they are a fantastic tribute to animation in all its glory. 'Wreck-It Ralph' is out in UK cinemas now through Walt Disney Studios.